You are currently browsing the category archive for the ‘Wednesdays With Mija’ category. When I first envisioned this blog, I was naïve. It seemed such a good idea to write about my old animals and what I was learning from them about aging. And in the beginning I wrote about the wonder of spending time with them. How they made me a better human being. And all of that and much more is true. But what I didn’t think about was the circularity of aging. How there comes a point with old animals (and people) when it’s time for them to leave this earth. And that hadn’t crossed my mind. So Bud was first to remind me of this life lesson, and my heart became much less naïve in an instant. When my older sister died this spring, my already-tender heart ached from too many goodbyes. Then on September 7th we lost another very important member of our family. Mija is a Spanish word for “my daughter.” And she was exactly that to us. For almost nineteen years this little cat enlivened and enriched our lives. She was the first domestic “pet” we shared – seeming very much like our daughter. From the moment we brought her home, until the moment she died in my husband’s arms, she was family. We console ourselves with phrases like: she lived a good, long life; we loved her beyond measure; and she loved us equally. But we are still grieving for her. Our home seems empty, especially her favorite spots. So many sunbeams seem wasted now. So many comfy laps go unfilled. Sometimes I think I hear her and for one brief moment, I get my hopes up. Maybe this was nothing more than a bad dream, I think. But of course it wasn’t. Grief has a way of messing with a person’s view of reality. All those years ago Mija had been abandoned. Her family moved without taking her. She was all of five or six months old and had no way of fending for herself in the big world. A kind-hearted neighbor tried hard to like her. 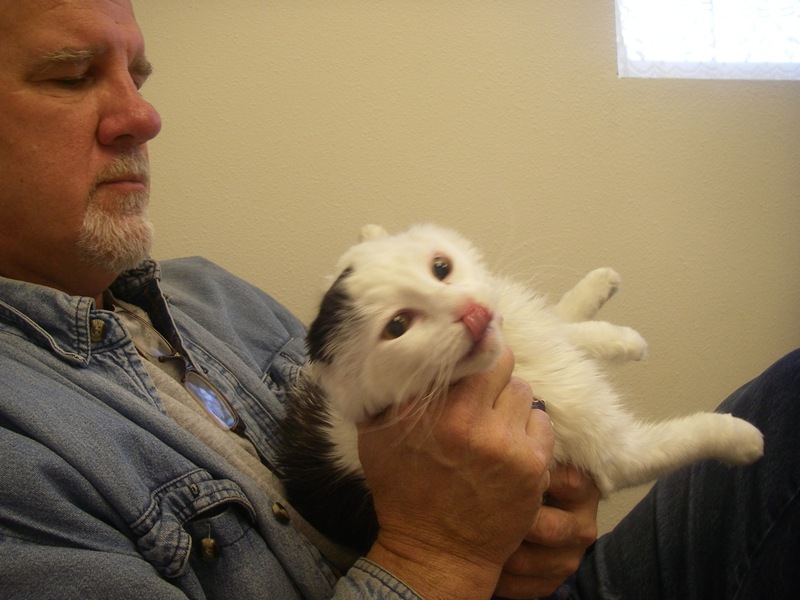 He took her in, supplied her with food and toys, but in the end he decided he just wasn’t a cat person. Thankfully he took her to our veterinarian, Dr. Robin Downing. Mija went on at least two other trial runs with families who simply couldn’t bond with her. I know now there was a bigger plan in play. She was meant to live with Rick and me. For us it was love at first sight. When I picked her up she immediately rewarded me with her quirky little purr. Rick said it sounded as if a bearing was going out. The metaphor was wasted on me because I don’t know a bad bearing from a jet engine. But I knew I was enchanted by this little black and white ball of fur. 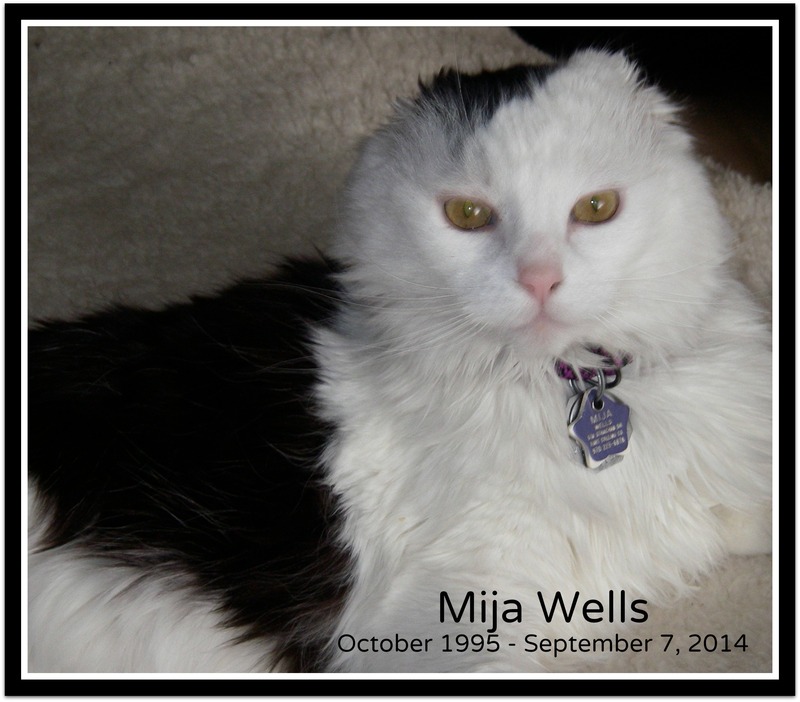 We have photographs and memories that eventually will comfort us and help us remember our very good life with Mija. Until then we are taking it easy. I know all of you who have lost someone dear know exactly what I’m talking about. To love with a wide-open heart leaves us sometimes feeling fragile and vulnerable. And we may be tempted to protect ourselves by closing down–not allowing anyone or anything to ever again get that close. For me that isn’t the answer. I want to live my life full out and open-hearted. No holding back. That’s truly the lesson my dear old sweeties have given me. Animals are resourceful. They know how to take care of themselves; how to get their needs met. And they’re not always terribly discerning. Take for example their belief that the large white porcelain fixture brimming with water is their own personal drinking fountain. At my sister’s house, they leave the toilet seat up on purpose, not because of a stereotypical neglectful male, but because the cat likes it that way. I know other folks that leave their faucets dripping a tiny drizzle of water for the cat. There’s no judgment here, because you know how I am–somewhat overly indulgent when it comes to my animals. Okay, maybe not even somewhat. I am overly indulgent. 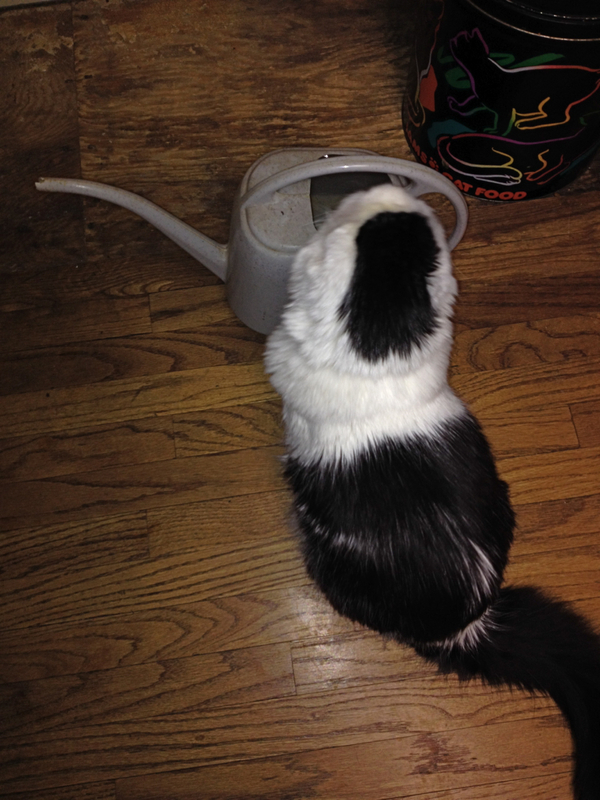 So when the other day we noticed Mija, our eighteen-year-old sweet little cat, drinking from the watering can, we figured she knew what she was doing. And even though she always has fresh water available to her, my husband started filling her bowl from the watering can. He seems to think she likes it better–maybe because the chlorine has outgassed. At least that’s his current working theory. Who knows for sure? She’s been silent on the topic, leaving us to our own speculations. For now we’re doing a split test. She’s getting watering can water from him and tap water from me. Aren’t we just the scientific couple! So come on, it ‘s time to share. What peculiar habits have your animals trained you to do? We’re all in this together so there will be absolutely no fun-making or judgment. Though we may be a tiny bit entertained. Our geriatric cat Mija is a master at asking for what she wants. She asks, she totally believes that it is going to happen, and voila, it usually does! She’s been a great teacher for me. Some might say she has trained us well. It would be true. I’ve watched with interest though to see how she gets what she wants, even though her life circumstance has changed. With age has come changes in her body. Changes in the how she does things, but never the actual doing of it. For example, she likes to spend her evenings curled up on my husband’s lap. She’s a big fan of his favorite television programs. In her more youthful days, she’d jump onto his lap, settle in and stay put. These days, she no longer is able to jump. So what does she do instead? She positions herself at the foot of his chair, which happens to be a recliner. And he lowers the “drawbridge” so she can climb onto his lap. Then when she wants down, she stands on the edge of the chair and asks to be lowered. She assumes it will happen, and it does. This routine occurs throughout the day. She asks and we respond. She wants up on the bed to nap in the sun and one of us lifts her into position. She wants to go outside for a sniff of the night air, and one of us opens the door and puts the porch light on so she can see better. She asks to be fed and one of us responds. Now you may think that she is just spoiled, but we prefer to think of it as an ongoing demonstration of ask, believe, receive. I truly think Mija is in our lives to model this powerful principle for us. And gently, but firmly she continues until one day we’ll finally get it! How are you doing with ask, believe, receive? Do you have animal mentors helping you grasp the concept? Do tell. 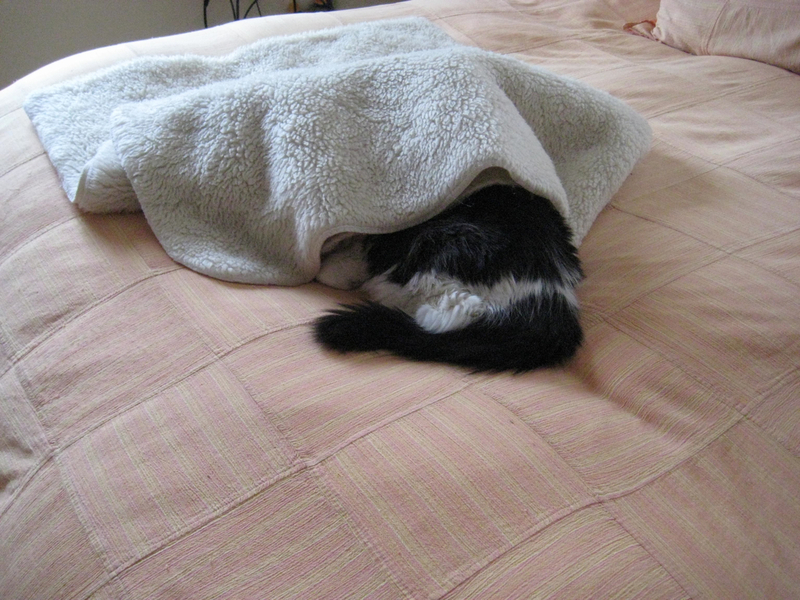 It’s been quite a while since Mija, our almost-seventeen-year-old cat has had something to say here in the blog. She took the spring and summer off. Her advanced years are catching up with her. She has back pain for which she takes medication. She sleeps much of the day. She has arthritis and doesn’t get around as quickly as she once did. She no longer jumps up onto the couch or bed, though she has trained us quite handily to do the lifting for her! And when she jumps off the bed or couch or chair, it is usually with a resounding thud. Long gone are the days of the lithe, graceful feline. Even so, Mija enjoys her life. She revels in the routine she’s enjoyed for all her years. She still sleeps in the sun, pokes her head out each day for a sniff or two or three of fresh air. She purrs like an expensive, well-tuned racecar. She loves to spend time with her peeps. And she’s been quite clear about the brand of food she is willing to eat. Her message is this: Life is good at all ages. If you must get creative about how you do things, well then GET CREATIVE. 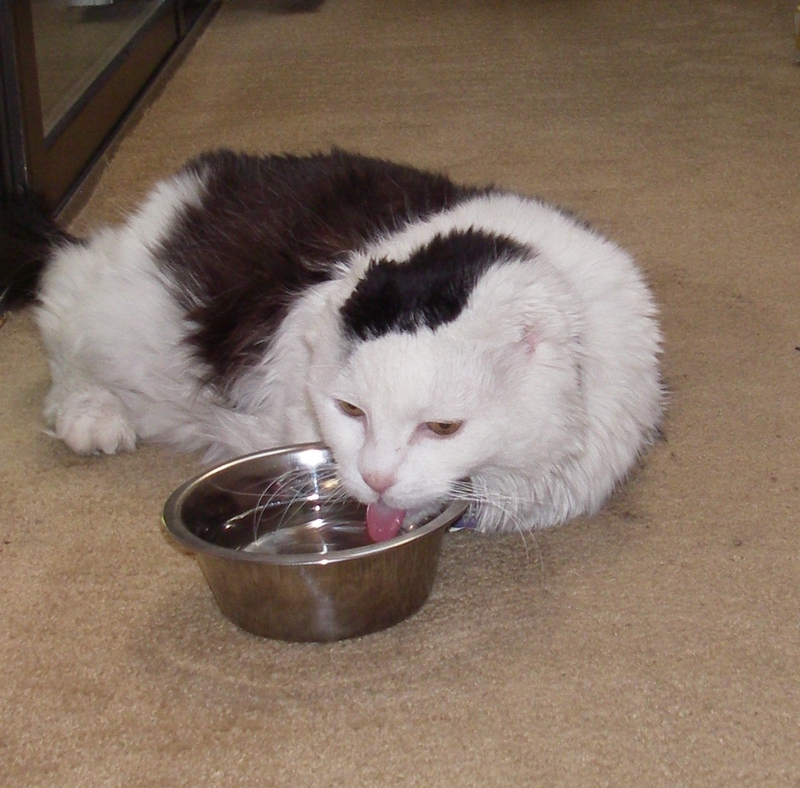 If you have to lie down to drink your water, so be it. Stay present to your life. And the people with whom you share it. Because this sweet life of ours is so very precious. And it goes by quickly. When is a Cage not a Cage? I’m not a fan of cat carriers. My people have an old one with hard plastic sides. Every time we go to the vet, they push me into it against my will. For some reason totally unknown to me, they think because the carrier is a dusty purple color, it somehow makes it tolerable for me. I find the entire process humiliating. How would you like to be shoved into a shoebox and carried by a handle that gives the box a decided tilt? Mind you, it was not without sufficient complaining on my part. Once in the exam room, they opened the door and I was set free. Problem was, I was in a place I didn’t want to be. I recognized the location immediately and knew it meant poking, prodding and all manner of other things I don’t appreciate. I did what any thinking animal or person would do. I tried to get back into the cat carrier. I pressed on the door with all my might, but it wouldn’t budge. More than ever I wished for opposable thumbs! It did get me thinking about the cages in which we all tend to find ourselves. Sometimes the thing we think is the barrier to our freedom isn’t a barrier at all. And other times, we cage ourselves without even knowing we do it. It seems to me it’s all a matter of perspective. What cage are you trying to break in or out of? It’s time for my annual treatise on the value of napping. It seems this is a topic that must be discussed every so often. In marketing I think they call it top of mind awareness. Cats don’t really need this reminder. I’m talking to you – my human friends and family. You may think I haven’t noticed you running around from one task to the next, to-do lists dangling from your hand. Or that I don’t see the tired look on your face, or pick up on the stress that sometimes radiates off your body. I notice and to be frank, I worry. You are a human being, not a human doing. And if you’re doing, doing, doing all the time, you’re missing out on some of the most wonderful luxuries life has to offer. 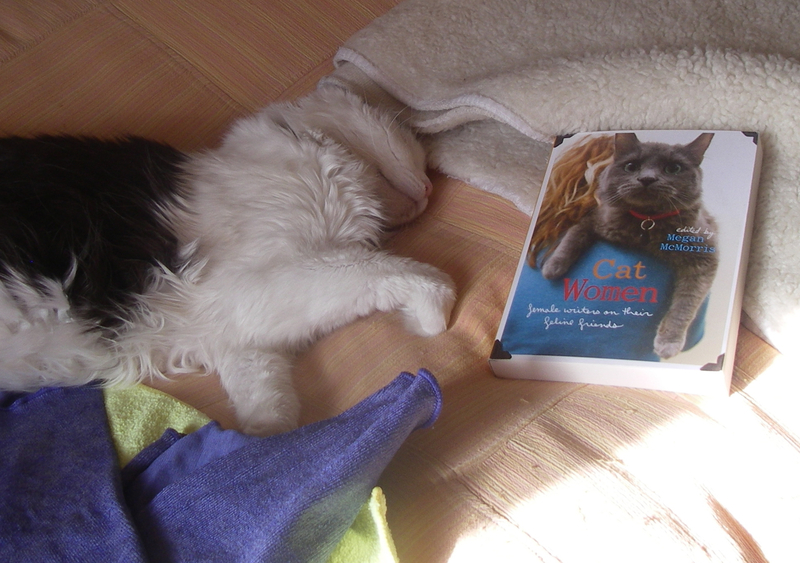 Luxuries like stretching out in the sun with a good book, and then when you’ve read your fill, drifting off to sleep. Dozing in the sun can work miracles for a bad attitude. You must trust me on this: Life is too short not to take naps. And spend time with the people you love. Only use them if they really do help you remember things or get organized. If they make you feel bad, crumple them up and give them a toss. Because this is the true nugget of gold we cats want to share with you – life is too short to feel bad. Now get out there and take a nap. P.S. Have you noticed in the photograph that I am totally ignoring the microfiber cleaning cloths? 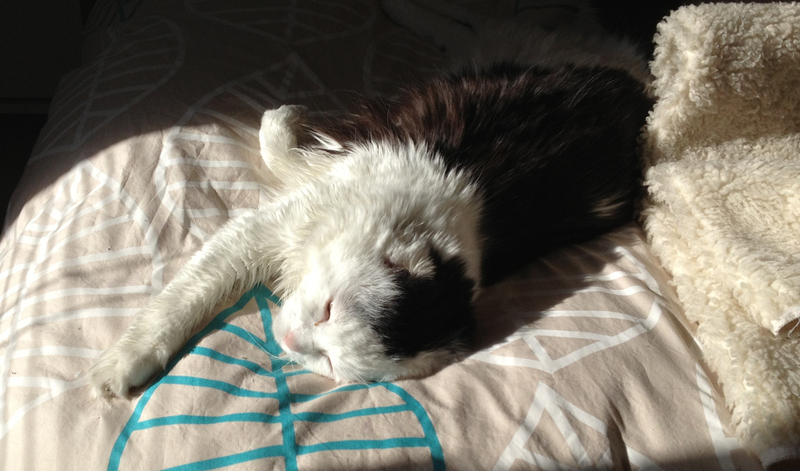 When this photo was snapped, I was all about napping in the sun with a good book close by. Nuff said. 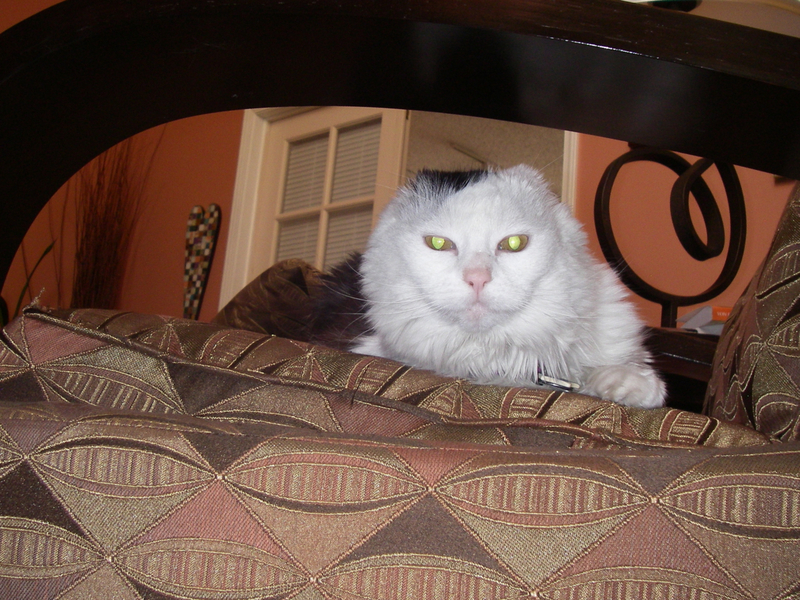 For those of you who are new to the blog or have forgotten, Mija is Jean’s sixteen-year- old earless cat. When she has something to say – like today’s post, Jean will translate for her. There are things that simply shouldn’t be mentioned in polite company. Thank goodness this blog isn’t one of those places, because I feel the need to tell you about my experience when I went to the veterinarian for a check up. I knew I’d get a sympathetic reception from you. I don’t relish these trips to the doctor. I’m not a car person. And I don’t like being poked and prodded. Especially by strangers. I don’t care how nice they are. I was in the middle of a perfectly wonderful late afternoon nap when my people scooped me up and stuffed me into the cat carrier. That alone was unpleasant to say the least. Then out into the cold we went. 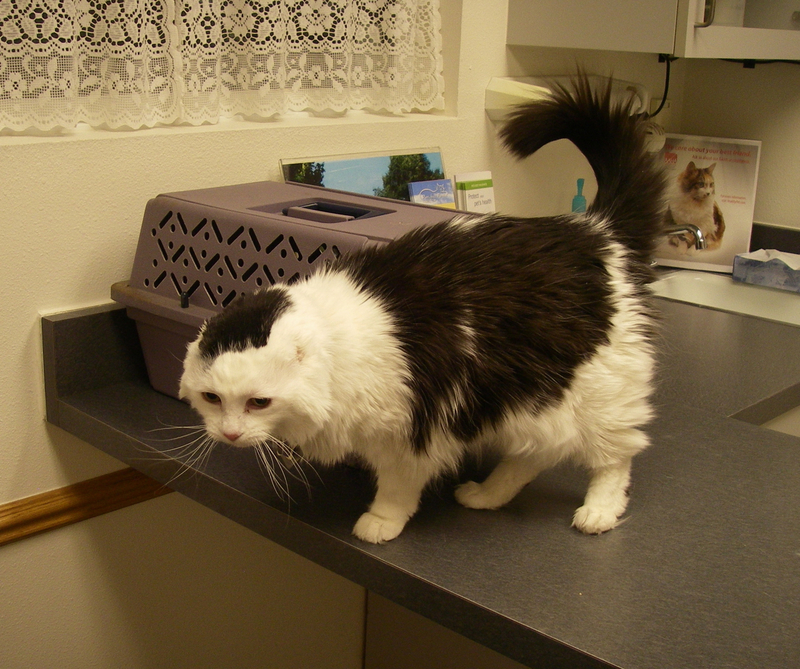 Funny thing though, once we got to the vet’s office, I didn’t want to leave the carrier. Now they had to pull me out. Turns out my back pain isn’t going away. I could have told them so without making this trip, but no one asked me. The chiropractic treatments haven’t done the job, so now I’m going to try pain meds. We finished the exam and while we were in the waiting room checking out, I had a moment. And there I sat in a purple cage, vulnerable as heck, trying to be pleasant when all I wanted was get back in the car and go home. I was purring loudly when all of a sudden a new noise came out of me. Out of the end opposite to my mouth. It sounded nothing like a purr, though I tried purring louder to cover up this new, offending sound. 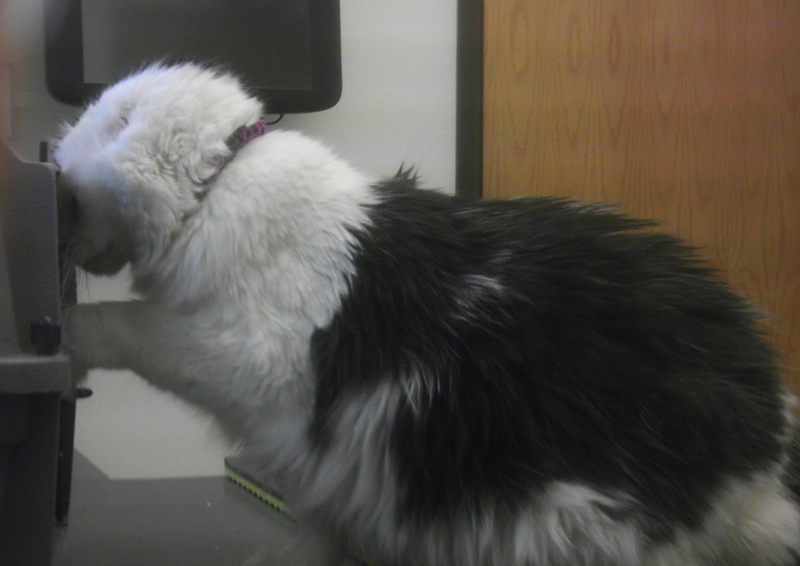 “What the heck was that?” The receptionist peered into my cage. Then she had the gall to sniff, and announce that there was NOT a good smell coming from my cage. Who wants their bodily functions discussed in public? Not me for sure. They tried to pull me from the carrier, but I dug in. No way was I going to do this in the middle of the waiting room with a yellow lab the size of a small dinosaur watching. Thank goodness my people decided to deal with this at home. They picked up the carrier and walked to the car. I’ve never been so grateful in my life. Usually I’m quite a talker in the car, but on this ride home I kept to myself. Shame and humiliation have a way of silencing you. Once home I had to get cleaned up. You don’t want the details here. But I do now understand a saying I’ve heard on occasion in our house. “Never trust a fart,” he says. Oh my goodness. So true. I know you must be tired from your busy week of flying around the world delivering presents to all the boys and girls. You’re probably sleeping late in the mornings, taking a nap every day and sitting in the hot tub to recuperate. But in case you’re taking a little time to evaluate how this Christmas went so you can make changes for next year, I have one teensy little suggestion. It’s a small one, really. Small but important to me. Could you please limit the number of noise-making gifts at our house to ONE? Yes, I know two-year-olds like to make noise. But seriously, bongo drums, a Cajun metal washboard thingy, a harmonica, a triangle, and numerous books and toys that make high-pitched electronic squeaking noises. I have to say you outdid yourself on the noise making gifts this year, Santa. I spent most of the holiday week with my head tucked under the fleece, trying as hard as I could to muffle at least some of the sounds wafting up the stairs. I know my peeps were really glad for the company. They adore that little noise-making boy. As for me, I’m still warming up to him. I’m not one to make rash decisions. I know he’s going to return to our house many, many times. I also know that it will make my peeps really happy. So, I’m getting my Christmas request for next year in very early. Do you have any sound-deadening earmuffs in your workshop? If you do, I could really use a pair. And if you don’t, you have a whole year to invent them. I think they could be a welcome gift for many cats and dogs around the world. Thank you Santa for considering my request. 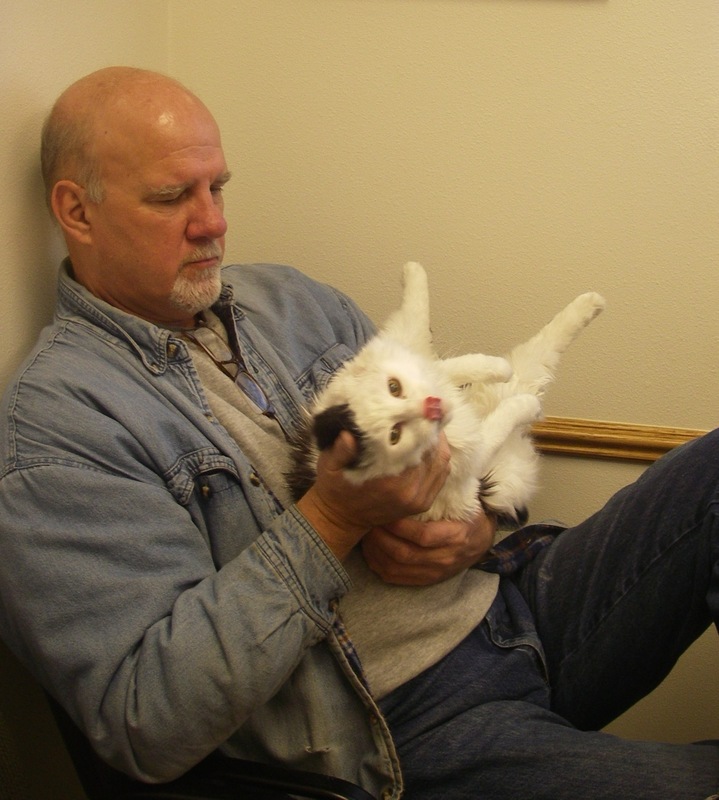 Feline Acne: Another humiliation of aging? I know it’s not Wednesday, but I just couldn’t wait until next week. I want to wish you the happiest of holidays. And tell you about my latest indignity. What is it about aging anyway? Haven’t we paid our dues? I was going along, minding my own feline business, when my peeps noticed some little bumps on my chin. Well, it scared them. They immediately went to the dark side and worried that my skin cancer was back. So they stuffed me into a cat carrier (against my wishes I might add) and drove me to the vet. And then to add another layer of insult, she squeezed it – popped that little bump. I mean seriously, is that any way to treat an aging cat? To my credit, I maintained my dignity even in this rather undignified situation. I did yowl a bit, just to make it perfectly clear that I was not a happy cat. In the end I guess it worked out okay. My peeps were hugely relieved that it wasn’t cancer. And well, I was too. Another surgery wasn’t looking like any fun. So now I have to have icky tasting medicine spread on my chin twice a day. P.S. If you’re looking for the acne in the photo above, you can stop. You can’t see it! Though I am giving my best “glowing eye” stare. Here’s hoping Santa is good to you!